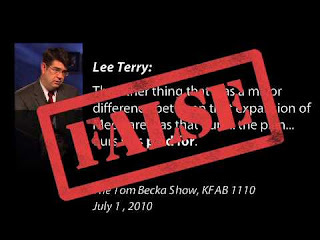 Dave Splash Dot Com: Could Lee Terry Reverse the Pro-Republican Trend? Could Lee Terry Reverse the Pro-Republican Trend? Rep. Lee Terry (R-NE) is easily one of the worst members of Congress. He's been there over a decade, yet his name is not attached to anything of any significance. He votes in lockstep with the most extreme elements within the Republican Party, and is known to spend an inordinate amount of time partying with female lobbyists. Somehow, he keeps getting re-elected by his district (which includes Omaha). In the last three election cycles, however, his margin of victory has decreased. Now, Walter Shapiro, senior editor for Politics Daily thinks that Terry may be something rare this year...a vulnerable Republican. "The battle in Nebraska's 2nd Congressional District could be a counter-intuitive indicator that helps determine whether the Republicans gain the 39 seats needed to take control of the House. If the Democrats win a few GOP-held seats (Dan Lungren in California, Hawaii's Charles Djou and Louisiana's Joseph Cao are other endangered incumbents), it could make the Republican's take-over arithmetic daunting." Personally, I thought Terry would lose in '08 since the district went for Obama (the first Dem electoral vote from Nebraska since LBJ), yet somehow he hung on. I hope Mr. Shapiro is on to something. I suffer from no illusions about the election this year. As I stated in the piece, if Terry was going to go down, I assumed it would have been in '08. I just thought it was an interesting look at how a conservative Republican, in a very red state, could actually lose in the year of the Republican. I'm sure there are others, but it doesn't fit the narrative the right and the media have created for the election this year, so it gets no coverage. I don't know that I would characterize this November as being the year of the Republican. The challenges and upsets with establishment candidates has caused the GOP to sit up, take notice, and at least talk like they now understand. I think it is more the year of the pissed off electorate actually. The electorate is pissed, sure. But not too many Democratic incumbents have lost in the primaries, that is a Republican phenomenon. And, remember, I don't see a dime's worth of difference between the Republican and tea parties. The fact that you don't see the difference between the Republicans and the Tea Party tells me that you really haven't been paying attention to their debate then, sir. I've been paying lots of attention, actually. They are one and the same. Notice how no tea party candidates ran as a Democrat or independent? That's because this entire media-hyped "movement" is just an internal struggle within the Republican Party.